Ever since 1889, when the General Conference on Weights and Measures (CGPM) made the imperious pronouncement, “this prototype shall henceforth be considered to be the unit of mass,” this platinum and iridium cylinder has served as the standard by which all other kilograms are measured, from the weights on a high-tech lab scale to the plastic discs high schoolers use in chemistry class. It’s known as “le Grand K,” and it’s afforded the security and scrutiny befitting such a fancy title. Even the researchers who work with it can’t touch it, lest their fingertips wipe away atoms or leave residue on the gleaming surface. The vault containing the cylinder can only be opened by gathering three custodians carrying three different keys, and that’s happened fewer than a dozen times in the kilogram’s 127-year history. Yet, despite all those precautions, “le Grand K” is getting slightly less grand. It seems to be shrinking — or at least, sister cylinders that used to be exactly its weight are now slightly heftier — and scientists don’t know why. Perhaps microscopic bits of metal were wiped away during washing, or perhaps Le Grand K has stayed the same and all those other objects have gotten heavier. Or perhaps that’s just the price of being a part of the physical world; nothing, not even “le Grand K,” can exist unchanged. Which is fine for philosophers, but not for scientists. So in 2014, at the quadrennial General Conference on Weights and Measures (yep, that’s a thing), the scientific community resolved to redefine the kilogram based on Planck’s constant, a value from quantum mechanics that describes the packets energy comes in. If physicists could get a good enough measure of Planck’s constant, the committee would calculate a kilogram from that value. On June 30, the day before the deadline to submit a value to the weights and measures committee, the team at NIST was finally ready to release its result. Based on 16 months’ worth of measurements, it calculated Planck’s constant to be 6.626069934 x 10−34 kg∙m2/s. Don’t be alarmed by this small, strange number. The most important thing about the NIST measurement isn’t so much the number (though that’s also a big deal) as the uncertainty: just 13 parts per billion. This means that the NIST scientists think their measurement of Planck’s constant is within 0.0000013 percent of the correct number. 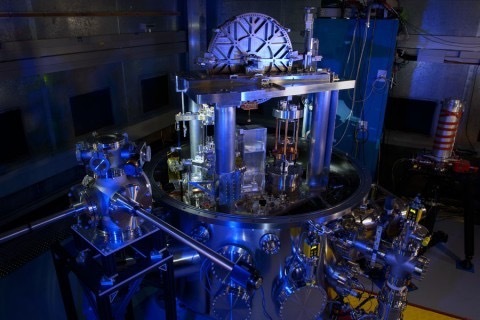 When the International Committee for Weights and Measures announced that it would reconsider the kilogram definition, it said it would require three measurements with uncertainties below 50 parts per billion, and one below 20 ppb. But with the new NIST measurement, the world now has at least three experiments below 20 ppb — another was conducted by a Canadian team using a Kibble balance, the third by an international group that calculates the Planck constant based on the number of atoms in a sphere of pure silicon. The weights and measures committee will meet this month to establish a global value for Planck’s constant by averaging the values calculated at NIST and other labs. And in 2018, at the next General Conference on Weights and Measures, the scientific community will draft a resolution to redefine kilogram based on this constant.